Just because you hate cleaning doesn’t mean you need to live in filth. You may not be able to buy a robot maid straight out of The Jetsons (yet), but there are plenty of automated ways to clean your house, if you’re willing to shell out a few extra dollars for the joy of watching a machine do your work for you. Here are seven pieces of technology that can help you combat dust, dirt, and allergens at home without lifting a finger. The iRobot Roomba has long been the gold standard in robotic vacuuming. While it may not be as effective as the human hand at getting into tight corners and over thick rugs, there’s no better way to clean the entire house while you sit on the couch watching television. You can preschedule cleanings so that your handy helper tidies up while you’re at work, and acoustic sensors help the robot flag particularly dirty patches of floor for extra attention. Newer versions are compatible with the Amazon Echo, meaning you can vacuum your home without even pressing a button. 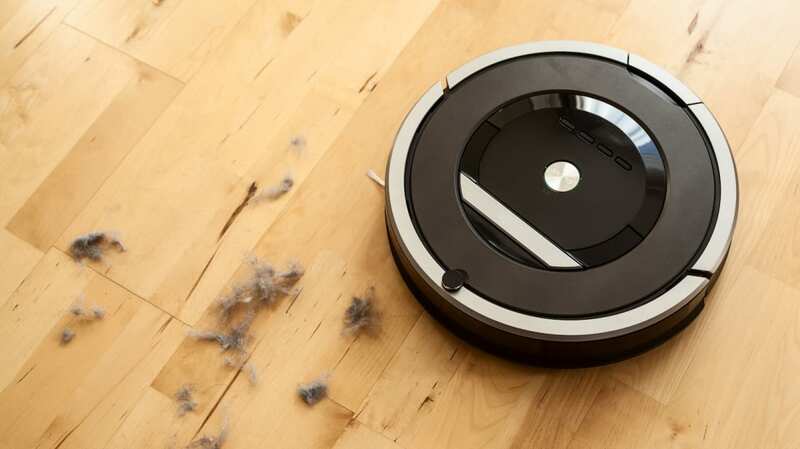 The higher-end models offer even more features: Roomba 900 series maps out its route through your home in the iRobot app to give you precise data on where it cleaned and what areas it spent the most time on, while the Roomba i7+ can empty its own dust bin. Hoover's REACT series of vacuums takes the upright to new heights. Outfitted with FloorSense technology, these smart vacuums know when you move from carpet to hard wood to tile, and can adjust the brush speed accordingly: On carpet, it'll use a faster brush speed to lift out stubborn dirt; when you move from the bedroom to the kitchen, the brush will slow down to prevent dirt debris from spreading. The REACT line is also Bluetooth compatible, so you can connect to the Hoover app in order to customize your FloorSense settings and monitor your machine's filter. The icing on the cake (for the pet-loving Mental Floss staff) is its superior suction and sealed allergen system that banishes pet hair from your upholstery and floor (at least temporarily). While iRobot’s foray into automated mopping isn’t as advanced as its vacuuming products, the Braava jet mopping ‘bot, first released in 2016, makes a decent pass at cleaning kitchens, bathrooms, and wood floors. Designed for any hard surface, the Braava 240 comes with three different settings—wet mopping, damp sweeping, and dry sweeping—and can be controlled using the iRobot app. The petite cube vibrates stains and dirt away using disposable pads ($8 for a 10-pack or $14 for two reusable pads) specific to the cleaning setting. The pricier, newer model, the Braava 380t, has just two settings—dry or a wet—but it can mop for up to 150 minutes on a single charge and is compatible with Swiffer and other cleaning cloths. Funded on Indiegogo in 2017, the Korean-made Everybot packs more power than the Braava. It’s a little bigger and can’t be controlled by an app, but its dual-spinning mops are designed to tackle spills and tough stains across the house with one touch of a button. It comes equipped with six different cleaning patterns as well as the ability to control its direction manually with a remote control. The mopping pads can be thrown in the washing machine or scrubbed by hand. It can also function as a duster: The robot has a handle on top, and you can grab it and run it over any surface, including windows. No one likes a full litter box—not even your cat. So unless you’ve trained your cat to go in the toilet, you could probably use a litter box robot to keep your scooping duties to a minimum. The Litter-Robot looks a little like a kitty rocket ship and can save you some major smells. When the cat steps on the sensor upon entering the box, it triggers a countdown clock to the next cleaning cycle. Seven minutes later, when your cat is long gone, the orb-like litter box rotates, sifting the waste down into a filtered storage bin below. You only need to empty out the waste bin every few days as it fills up, and there’s never a smell—perfect for a house with multiple cats. Some reviewers note that it cuts down on their litter-and-dust triggered allergies, too. Buy it from Litter-Robot for $449. Outfitted with a True HEPA filter, this air cleaning system from GermGuardian captures 99.97 percent of allergens and asthma triggers, including pet dander and pollen, as well as reduces airborne bacteria. Use the corresponding app to monitor and control your home’s air quality from anywhere.